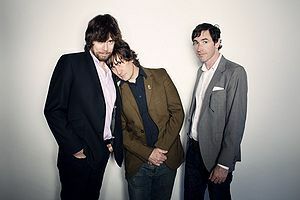 The Mountain Goats are, for all practical purposes, the endlessly clever and prolific John Darnielle and whatever musicians he surrounds himself with, which means that while the soundscape may change from project to project, the overall tone and feel of Darnielle's work remains remarkably consistent. At his best, he writes finely observed, slightly surreal, impressionistic vignettes that manage to mix life as we live it with life as we wish we could live it, and as such he has more in common with a short-story writer than he does with the typical singer/songwriter. I was at The Mountain Goats concert on Tuesday October 21st in Portland, Oregon and John Darnielle of The Mountain Goats covered Suedehead by Morrissey. John prefaced the song by saying that Morrissey was pretty big in all the clubs when he was living in Portland but that he personally couldn't stand Morrissey. and I don't like you"
John then admitted that he has since come around and that he is now a fan. Then The Mountain Goats along with Kaki King accompanying on guitar proceeded to play Suedehead. It was a fairly faithful rendition of the song, and a great concert! ↑ Jason Nickey. Biography: The Mountain Goats. AllMusic.com. Retrieved from AllMusic.com. This page was last modified on 8 April 2013, at 08:07.